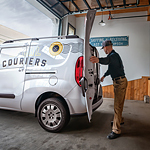 Having a compact body, the 2018 Ram ProMaster City is a van that's designed to transport cargo in Gaylord, MI. Available for lease and sale at Feeny Chrysler Jeep Dodge, this model is affordable enough for small businesses and organizations. Every trim rolls out of the factory with a five-year/60,000-mile warranty on the gas powertrain. The basic limited warranty is valid for three years or 36,000 miles, whichever comes first. A five-year/100,000-mile warranty covers any parts that rust or corrode. Fitted over 16-inch wheels, all-season tires keep this cargo van rolling with confidence on urban roads. This Ram model has numerous standard safety features that protect occupants from serious injuries. An inflatable air bag cushions the driver's knee during a crash. This reliable van has seven total air bags that inflate at variable rates in response to the severity of an accident. Speed-sensitive power locks are also installed in the cabin.